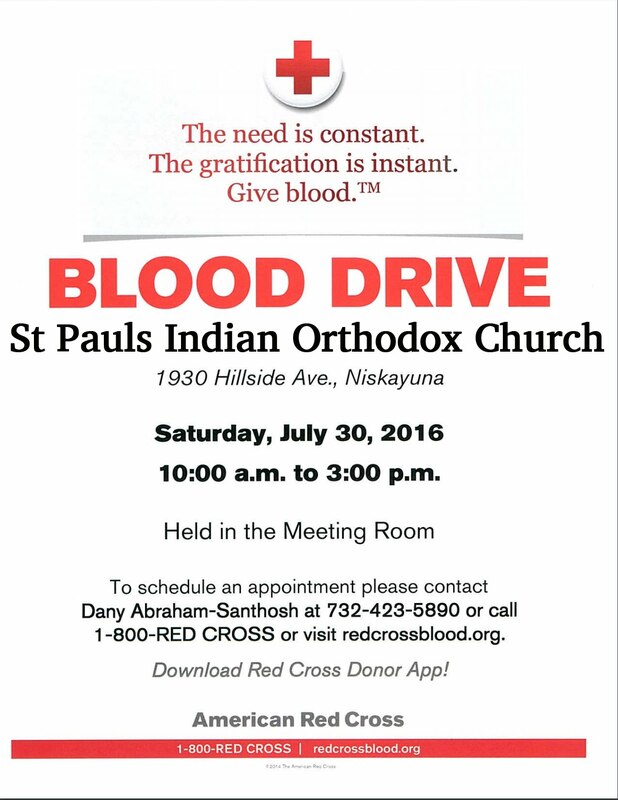 American Red Cross is organizing a blood drive in association with St Paul's Indian Orthodox Church, Niskayuna NY. Please see the attached flyer for more info. As you know, the need for blood is constant. Although thousands of people are donating blood, it is never enough. You can also donate blood every 56 days which not many are aware. We encourage you to participate in this blood drive. The gratification is instant. Be the one to make a difference. Save the Date and do register to donate! to schedule a time slot for donating blood/double blood cells, so that you don't have to wait. If you have any questions regarding this blood drive, like for example : Am i capable? Does my ailment stop me from donating blood? or any other blood drive related questions, please feel free to contact Mr. Dany Abraham. Also, please pass and share this information/post with your friends and neighbors too if they would be interested.